As part of it's handling and conveying range, ABC Hansen offers a range of solutions for receiving grain from trailers and trucks.The options offered by ABC Hansen are: Mobile hoppers (click here for more information), above ground steel reception bins, below ground dump pits with drive over grating and combination weighbridge-dump pit solutions. Lengths range from 1 meter up to 22 meters, with widths usually ranging between 2.4 meter and 4.4 meter. 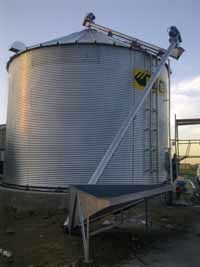 The above ground, steel reception bin is usually used in low capacity, low turnover grain storage and handling systems. This system provides a low cost alternative to below ground dump pits, as it involves nearly no civils, no groundworks, and is easily installed. The triangular bin is designed so that a side drop trailer, or a back tipping trailer can easily dump into the bin. The bin has a sturdy mild steel construction with a painted or galvanised finish. 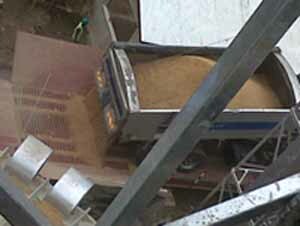 The flow of the grain is by gravity into the auger, which is mounted at the bottom of the triangular bin, from where it is picked up and the grain is then transported to the next stage. Typical dimensions of this bin is 3,000mm width, 1,200mm height and a depth of 1,500mm. As part of the ABC Hansen handling program, we also offer drive over grating, pre-designed to be mounted over a dump pit. Drive over grating is constructed of I-Beams and Angle Iron, which are pre-cut and pre-formed according to the dump pit that they will be mounted on. When the unit arrives on site it is just a case of placing the parts and welding or bolting them together. Optionally drive over grating can also be provided in Mentis Grating or in round tube, depending on specific client requirements. As standard all drive over gratings are covered by a rust inhibiting paint before being shipped, and are touched up on site once they have been placed and fastened. Optimal spacing on the items are used to ensure safety as well as effective flow through, and as far as possible all "dead corners" are eliminated. In the last few years, there has been an increased demand for wider and longer dump pits, due to the use of side tipping trailers (such as ore carriers) to transport grain. These side-tipping trailers have a dump length of between 6 meters and 12 meters, which makes them very difficult to handle in conventional dump pits, which in the past have been designed to only handle side drop trailers with a maximum dump length of 3 meters. Sizes are made to fit, but will typically range between lengths of 2 meters and 20 meters and widths of 2.4 meters to 4.4 meters. 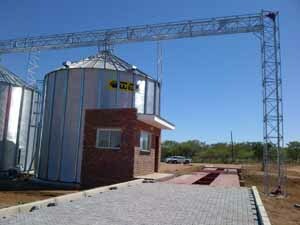 ABC Hansen Africa offers a combination weighbridge-dump pit as part of our mass measuring program and our grain handling program. 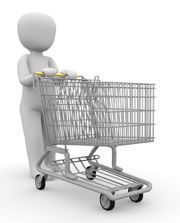 3) There is a significant time saving on your receiving and dispatching procedure. Because the dump pit and the weighbridge are combined, the delivery vehicle can drive onto the weighbridge, be weighed, then without going anywhere unload its load. When unloading is completed, the vehicle is weighed again, and a net delivery is obtained. In a traditional system, the vehicle would cross the weighbridge when full and be weighed. After weighing is completed, the vehicle would then proceed to the dump pit, where it would unload. 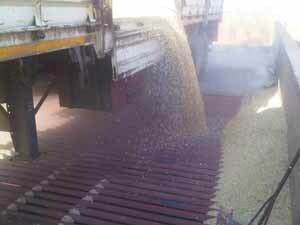 After unloading, the vehicle would then drive back to the weighbridge and be weighed again to obtain the net delivery. Which of the two options sounds better and quicker to you? 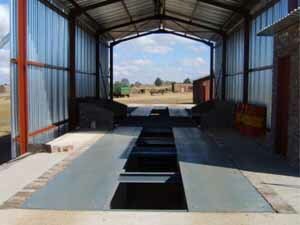 Our weighbridge-dump pit combinations have various combinations. Please contact us to design or suggest a combination that will work for you.